Whenever locals ask where to find the most authentic ethnic food, I advise dining with the local expert. If you said you were craving Greek cuisine, I’d say you’ll find the best at the Wild Donkey in SLO, owned and operated by chef George Kartsioukas and his wife Kay. George started his culinary career in Greece, and his passion for cooking is evident in every delicious dish on his menu. Although I wrote up this friendly little eatery when it opened early in 2011, many changes have taken place since then. I discovered that the tasty, well-priced menu offers more fine Greek dishes, and they opened the cozy patio out back. I stopped in for a meal after returning from Italy last week and found I was still impressed by the freshness of the foods served here, most of which are made in-house. Not only that, I loved the new choice of Hearst Ranch hamburgers, although I enjoyed the outstanding lamb burger with peasant fries ($11.95). The spicy, ground lamb burger was superb, tender, and tasty with none of the greasiness found in chain beef burgers, and I loved it. My husband Dan had ordered it on a whole wheat bun and kindly offered me a bite. I ripped off a huge bite and wanted to steal it—not to mention their Greek-style fries. The thick, wedge-cut potatoes are blanched first, then fried to order. The cooks finish them by tossing the fries in extra virgin olive oil and Greek oregano. They are as delightful on their own as they are with the tzatziki sauce, or my guilty pleasure of the Heinz catsup as I use with French fries. One of my highlights in the original review of Wild Donkey was their Mexican foods, which I find much better that what I’m served in local Mexican restaurants. That’s because the Kartsioukas moved here from San Francisco’s Mission District, where you’ll find some of the best Mexican food in California. While living in San Francisco (1986 to 1996), I frequented those value-priced taquerias at least once a week. They also inspired the chef Steve Ells, founder of Chipotle, when he started his high-quality restaurant chain. I loved the taquerias for their huge burritos with the works, including chips and salsa for $5, which I usually ordered to go. The Mission District is also home to the Greek community and where the Kartsioukas worked in restaurants that served both Greek and Italian foods. Kay was born in San Francisco after her Greek parents immigrated to the United States, and she met George after he relocated there when he was 18. Married for 35 years, they moved here planning to open a restaurant that offered both Greek and Italian cuisine, but they felt there were already too many Italian restaurants in SLO. So George created a menu that featured Greek and Mexican dishes, with a little bit of fusion. For instance, I really love their fajitas with lamb instead of the traditional steak strips, topped with a sauté of peppers, onions, zucchini, carrots, and garlic ($12.50 to $13.95 depending on choice of meat). But over the past year, they found that locals did indeed want more Greek food. During this visit we checked out the comfortable patio with umbrellas and the Central Coast fresco on the wall, but the afternoon sun was too warm and we preferred the cool interior of the dining room. Sitting along the window-doors on the front wall, looking out onto Broad Street, it feels like you’re on a patio even when you sit inside. We concluded the meal with dessert: a special tiramisu ($7.50) prepared the way George made it at Bambino’s Restaurant in San Francisco. The tender ladyfingers are layered with mascarpone whipped with egg yolks and sugar. Rather than just Marsala wine, he combines it with light rum and brandy which give a distinctive flavor. The slice is topped with a drizzle of dark chocolate, which provides a delicious contrast to the sweet cake and cream. Kay explained that they offer classic Greek treats like Baklava and the Wild Donkey brandy balls; Greeks are very fond of decadent desserts like tiramisu. On Wikipedia, I learned that the word tiramisu means “pick me up” (metaphorically, “make me happy”). It really made us happy paired with the KEO St. John Commandaria dessert wine ($6.75/glass). 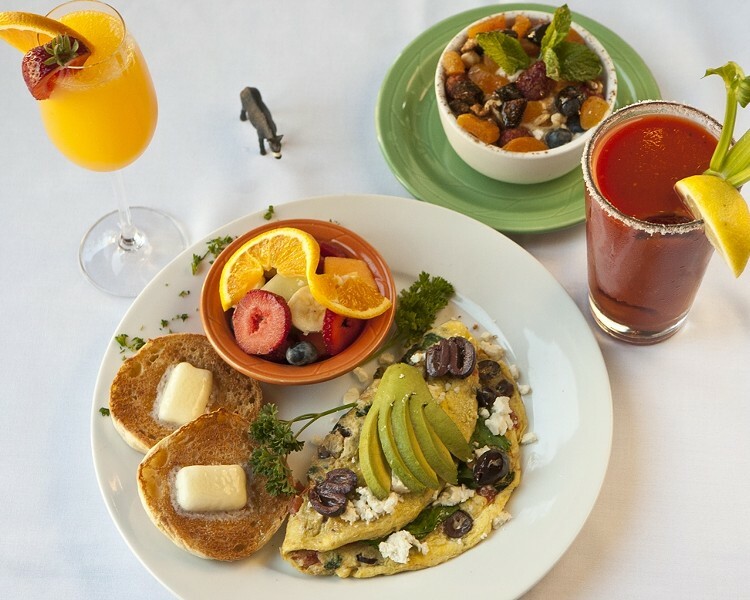 The newest change is the addition of breakfast and lunch served on Saturday and Sunday, which runs from 9 a.m. to 2 p.m. (they serve all day long for late eaters), where you can get the basics, omelets and pancakes, along with the mezes, wraps, sandwiches, and entrées. When I originally spoke with George, he said he wanted Wild Donkey to be a place where people could feel comfortable dining there daily without spending too much money. While it’s not cheap like the chains, you definitely get what you’re paying for: good quality food prepared by an honest, talented chef who serves generous portions. Judging by the number of regular customers who eat there at least once weekly, that’s the one thing you’ll find hasn’t changed at Wild Donkey.